A GREAT PIZZA BASE RECIPE | YUM YUM PIGGY'S BUM...! Wow, having a fab weekend so far with glorious sunshine and got my recent work stresses out of way so to top off my weekend I decided to make some italian-style pizzas. Always wanted to make my own but previous attempts weren’t so successful. Have tried making them from the dried pizza mix which you add water to but the dough wasn’t crispy and also those pre-made pizza bases have the wrong texture and don’t taste freshly baked. Looked on the web for tried and tested recipes for a reliable pizza base dough and wanted to share one from the BBC food website by Angela Nilsen who is a food writer. She has written about how, we, the ordinary folk at home without a wooden pizza oven, which reaches very high temperatures, can make a great pizza and not have to wait many hours for the dough to rise. She recommends adding semolina to the dough to give it a crunchy texture and bite and for sprinkling on the baking trays so the grains act as roller balls and help the pizza slide off the tray effortlessly. She asked Dan Lepard, a baker with unconventional baking methods, for advice and he uses a sticky dough with minimal kneading explaining that the water hydrates the gluten in the flour producing a stretchy resilient dough. Her recipe was published on the BBC food website and got a 4 out of 5 star rating so what the heck, I thought, I’ll give it go! Well guess what, after alot of inspection and worrying about the dough feeling too sticky, it was the best homemade pizza dough recipe I’ve tried so far! Had a crispy texture and wasn’t too heavy in terms of the thickness of the dough. 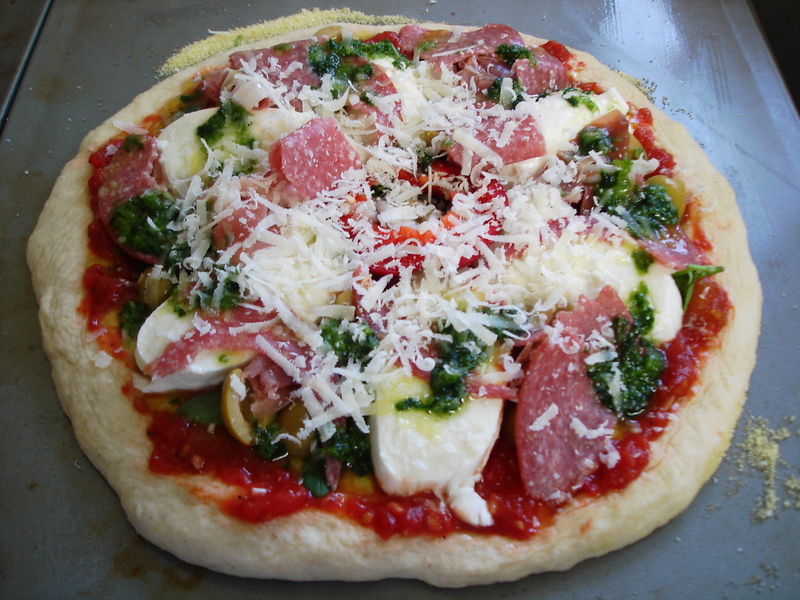 The toppings were good quality ones which makes all the difference to making a very tasty pizza. Definitely makes a pleasant change from takeaway pizzas which can be way too stodgy with cheap ingredients such as strange, unknown rubbery cheeses and a soggy thick base. 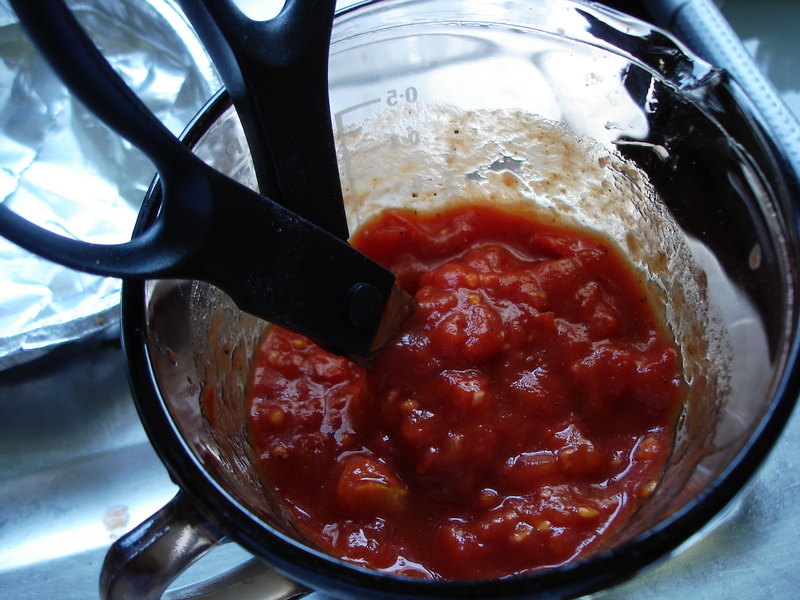 You can make your own tomato base by cooking good quality plum tomatoes, onions and italian herbs but I opted for Angela Nilsen’s quick, simple, no-cook tomato base for speed of preparation which is detailed in the recipe below. Made a flavoured oil from crushed basil, lemon juice, salt, garlic and olive oil as suggested by boyfriend and the aroma from those bashed ingredients was very pleasing. The only thing I would change is the tomato sauce for the base, it was a little bit too runny and needed to be thicker so next time will simmer tomatoes with herbs and let it reduce and thicken in consistency or buy a pre-made tomato sauce. Another thing is DO NOT be too hasty when transferring your pizza from the baking tray to your plate as according to my housemate, his pizza dough somehow slid off so quickly in the blink of an eye leaving most of his topping on the baking tray. The semolina really does work!! As summer is approaching, will be making more pizzas for al fresco dining in my back garden. Now all I need now is a swing seat to snuggle up with my boyfriend eating pizza and drinking wine while watching the sunset. Aaah, the simple things in life! If any of you foodie pizza lovers out there have a fabulous pizza base recipe, please let me know as I’m always on the lookout for any improvements. 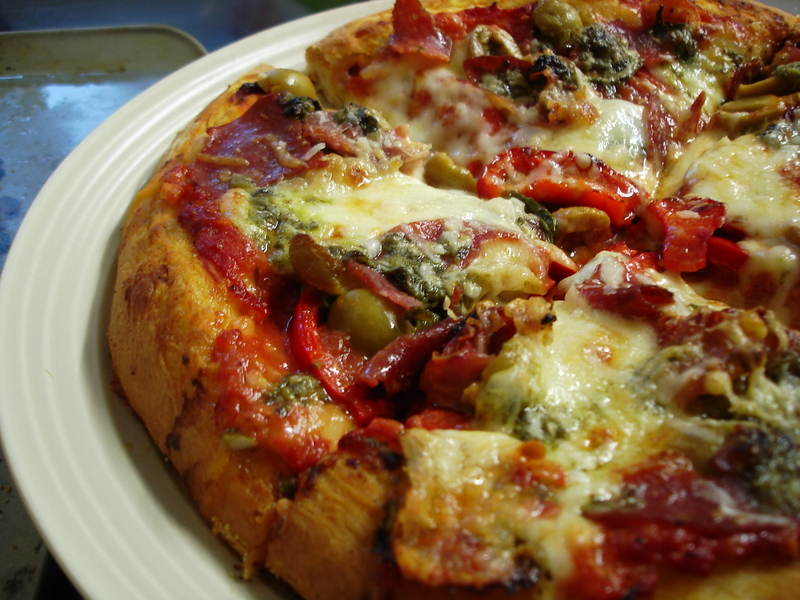 optional toppings such as proscuitto ham, pepperoni, sliced peppers, olives, mushrooms etc.. Fill a large bowl with warm water ready for you to wash your hands in between handling the dough. In a bowl, mix flour, semolina, salt and yeast. Make a dip in the middle, pour in oil, water, then mix and squeeze everything together using your hands. The dough should feel very sticky. When it is well mixed, cover with a tea towel and leave for 15 mins. Tip the dough on to a lightly oiled work surface. Pour about a tablespoon of oil onto a piece of kitchen paper and use this to rub the inside of the bowl so it is oiled. 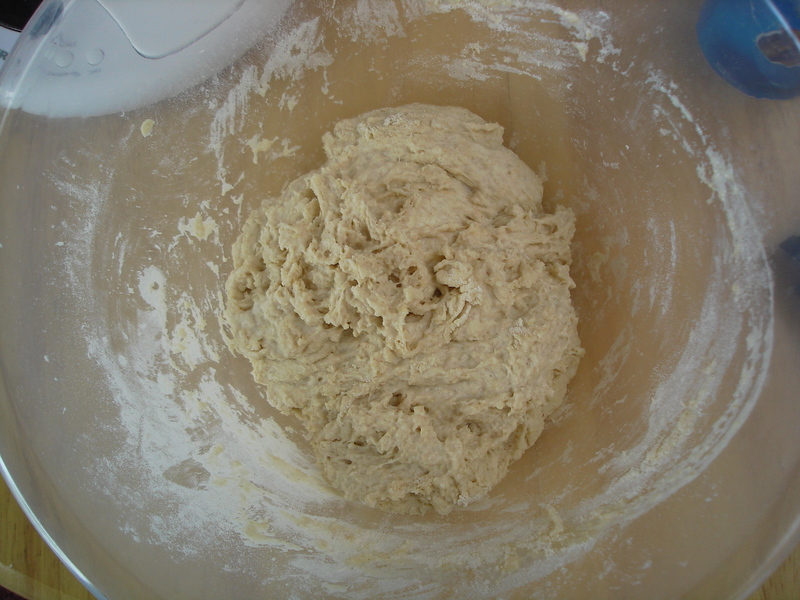 Oil your hands lightly and knead the dough about 12 times, and make into a ball shape, lay it in the bowl, seam side down. Cover and leave for 10 mins. Repeat the kneading and leaving for 10 mins again, then knead and leave for 15 mins, oiling the surface and your hands each time. Do not worry if the dough feels tacky, this is normal. In between kneadings make the sauce for the topping. Drain the tomatoes and tip them into a bowl. Snip them into small pieces with scissors. Stir in garlic, tomato purée, and seasoning. Set aside. Brush a baking sheet with oil and sprinkle with a little semolina. Heat oven to 240C/fan 220C/gas 9. 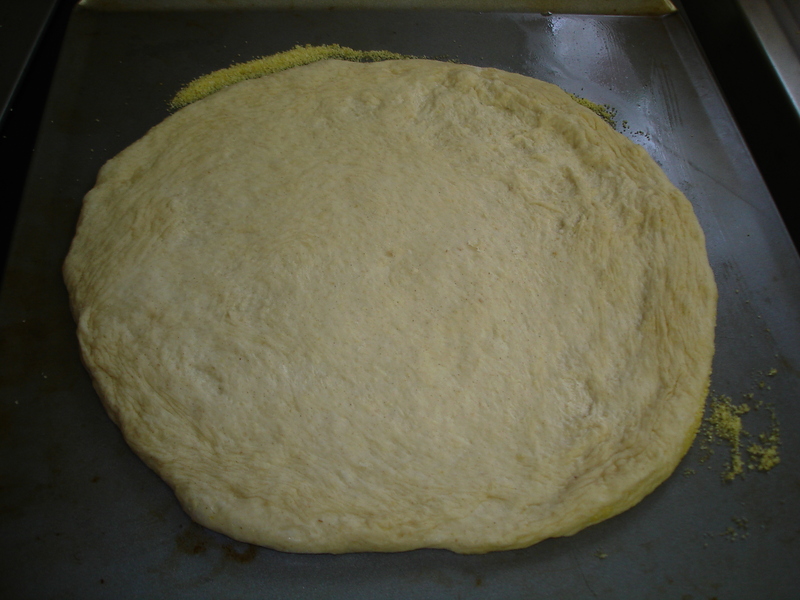 When the dough is ready, cut in half and put one half onto a lightly floured surface. 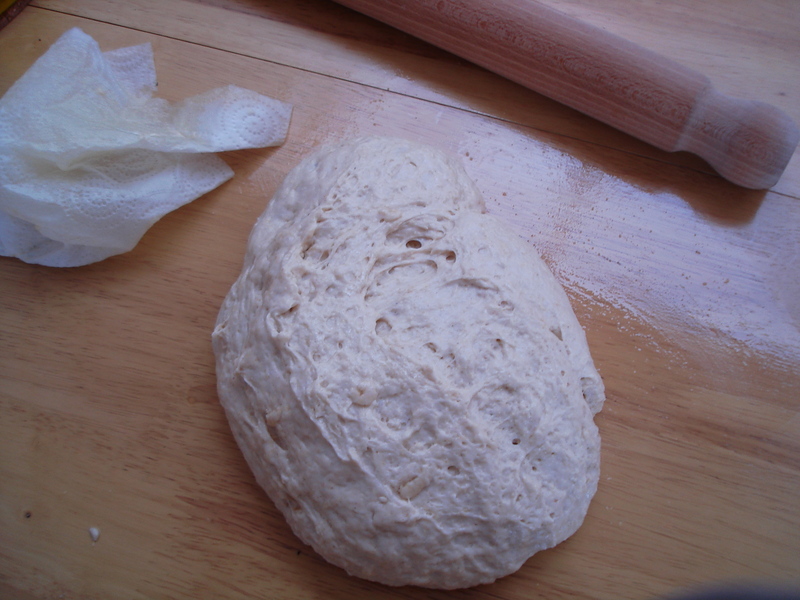 Knead 4-5 times to squash out any air bubbles, then roll it out. At the point where it just keeps springing back, brush off the flour from the work surface and rub on a little oil. This makes it easier to roll. Continue to roll out until you have a 28cm circle, pulling it into shape as well. Lift it onto the baking sheet (it’s easier if you drape it over a rolling pin). If you want to make a flavoured oil for drizzling over the pizza, put all the ingredients except for the lemon juice in a mortar and pestle and crush until they are well combined, then add lemon juice to your liking. This should take about 5 minutes. Drain the mozzarella, then pat dry with kitchen paper. Spread half the sauce over, almost up to the edge. Scatter over half the basil, then slice or tear up one mozzarella ball and scatter over the basil. Season with black pepper and drizzle with a little oil. Bake for 12-15 mins, until the topping is bubbling and the dough browning. Repeat with the remaining dough and whatever toppings you like, however don’t overload your pizza otherwise the dough will be cooked before the toppings are baked through. To serve, you can scatter parmesan over the pizza. Drizzle normal extra virgin oil or a flavoured oil like mine over the top. I’m glad you had a go at making your own pizza, it really is like an experiment, you can add whatever you like as long as you have a tomato sauce base and cheese on top. I didn’t add peas to my pizza, those green things were lovely olives :-)! A fish topping! I know people who put tuna and anchovies on their pizza, hope you were satisfied with your creation! Scissors are not necessary, you can just use a knife. I used scissors to cut the tomatoes in a jug so I wouldn’t have to use a chopping board. Ahhhhhh I didn’t think the peas would be normal LOL smile he he. My fish was called Anglerfish but I call him Dracular because they look mean and are difficult to catch like the head of all the vampires. It take me an hour to land him and he didn’t taste to great even so but the bread was super super lovingly. Thanking you for your helping of me and like to try biscuits but I dont know these nuts here. Wow, that was one hell of a fishing trip to catch that fish, not a pretty looking one for sure! Very popular in America but if you can’t find those nuts, try using walnuts or almonds or macadamia nuts. Sandra loved it with Monk’s fish. It was splendid though she did get some on her top which was naughty. I’d definitely try it out with semolina sometime soon. It gives the dough a lovely tinge of yellow too, doesn’t it? Making it look extra delicious. Have you heard of skinny pizza? Most people call it thin-crust pizza. In any case, if you’re feeling like some extra crunch in your slice, try this!